Home » Bon Voyage! Jessy and Caroline!! Bon Voyage! Jessy and Caroline!! LICF would like to send traveling mercies to Jessy and Caroline as they embark on a new chapter of their lives with a move to Florida. 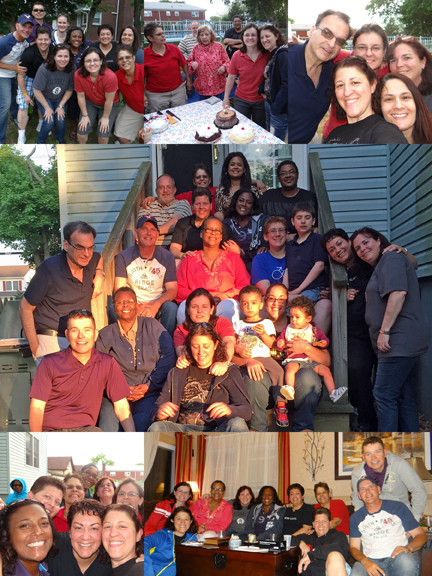 On Saturday June 6th we all gathered together at Deacon Eva’s home to give our farewell messages to two of our dearest LICF members. There were a lot of tears and a lot of laughs!! We will miss you gals immensely! “In 2007, we bought our first home in Long Island and we were searching for a church we could call our own. After visiting a few church communities, we stumbled upon LICF. The members were so welcoming – with open arms and smiles on their faces; Pastor Shane filled the room with God’s Word of love and acceptance (regardless of who we are), and the music played was uplifting and joyous! We knew that was home. The LICF community has become our extended family throughout the years. Although our busy lives and travel schedule, sometimes keep us away, we know we can always walk in the door and feel at home. LICF is a growing community striving to reach all those looking to regain their faith – it is a place you can be yourself and know that we are all loved by God.